"It's not enough to do your best; you must know what to do and THEN do your best." The new "Staging Diva Workbook: Planning Notes, Worksheets and Scorecards to Start and Grow Your Business with Confidence" is 100 pages of guided exercises based on the material in the Staging Diva Home Staging Training Program. I've set it up so all you have to do is work your way through filling in the blanks. At the end, you'll have a pretty solid marketing plan to guide the growth of your business. I've given you forms & checklists to fill out for all the action steps and homework I recommend throughout the training program. This workbook is only available to Staging Diva Graduates and to students ordering the 5 course package. If you're taking the courses one at a time, you'll be able to purchase it after you've ordered all five courses. The new workbook is still available at the pre-publishing price of $75 until May 1. 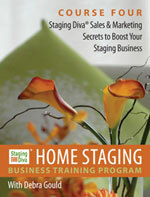 If you're already a Staging Diva Graduate and you want to sa.ve $20 before May 1, email my assistant Sandy. On May 1, the cost of the Workbook goes up to $95. If you order the Staging Diva Training Program (all 5 courses), before May 1, you'll automatically get offered the Workbook at the pre-release price of $75. Now is the perfect time to think about how to get what you need to start and/or grow a successful home staging business. Learning from home cuts your costs and time commitment. And did you know that I am the only person teaching home staging who has business credentials and has actually built a successful home staging business? With course recordings and study notes that are emailed to you right after you order, you get to listen to the material as often and whenever you like! And if you order before May 1, you can get the new Training Program Workbook for only $75. I just finished two long interviews and photo shoots. One for National Post which will feature me in a full page cover story in their Saturday Home Section, likely out May 3. I'm really excited about this as the National Post is Canada's second largest newspaper. 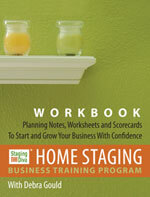 This will generate lots of projects for members of the Staging Diva Directory of Home Stagers! The other shoot and interview I did this week is for a story for This Old House Magazine, July/August issue, on news stands in June. With a circulation of over 6 million, this too will generate projects for Staging Diva Graduates who are part of the Directory. The half hour radio show I did for KFOR 1240 was great fun and provided listeners with lots of reasons why they can't stage themselves and really need to hire professional help. I have a recording of the program and hope to figure out soon how to put it online so you can listen in. Unfortunately none of my Graduates in NE are part of the Directory so radio listeners were unable to find them after listening to the show. Staging Diva Graduates, it's worth asking yourself what it's costing you in lost opportunities not being part of the Staging Diva Directory of Home Stagers! Learn how to join so you can take advantage of all the media attention I bring to the Directory to help prospective clients find you. Has anyone seen me in the Chicago Tribune? They wouldn't tell me when the home staging story they interviewed me for would run. If you're in Chicago, please check the Sunday Homes section. The Better Homes and Gardens staging story is still waiting to go to press six months later, though they tell me it will run. One of the many frustrations of dealing with the media is you never know when they'll use your interview! And you have to keep your fingers crossed that they'll spell your name right and include your company name. Peggy, our Manager of Operations is absolutely fabulous and supervises many others behind the scenes. I always review (and sometimes edit) all directory listings, before they go live and create the tags for search engines to find you. Don't forget it's important to properly organize your materials for your Directory listing. If you don't follow the step-by-step instructions we give you when you order, we can't guarantee your listing will be up within 7 days. And we have to charge extra if you send us dozens of portfolio photos to sort through when you're only supposed to submit six. Besides, you should not put the important task of shaping your portfolio in someone else's hands. It's a key piece to building your image as a professional home stager. It's not difficult to submit your materials for the Directory. Take the time to organize your material and then just follow the step-by-step instructions I send you when you order. I've been blown away by the response to the new "Staging Diva Home Staging Consultation Checklist With Room-by-Room Client Planning Forms" which has been purchased by new and established home stagers alike. This made me realize there's a real need for simple fill-in-the blank checklists and that there is more anxiety than I realized around the Home Staging Consultation Process. This $45 product is f/ree when you order course 3 or the full Staging Diva Home Staging Training Program. By the way, speaking of fill-in-the blanks, the new Staging Diva Workbook will be published May 1, but it's only available to Staging Diva Graduates or new students purchasing the 5 course package. To celebrate the launch, I've been offering a $20 d1scount on this new product for the last month. Learn more in the sidebar story at left. This month I've been really busy with media interviews and sending before and after shots out to publications. You can read more in this issue about upcoming media coverage in Staging Diva In The News. This is a final reminder that you can take advantage of the 10% d1scount offer I made to Staging Diva Dispatch subscribers at the new Staging Diva Home Staging Art Shop. Just use this special code when you're at the checkout: StagingDiva10 before May 15. In the new Art Shop, I've hand-picked 100 pieces of art suitable for home staging and told you which rooms I recommend them for. I've also done the math for you so you'll learn how you can make a pr0fit from the collection. When you visit the Art Shop, don't forget to sign up for your f/ree copy of Staging Diva's Top 10 Tips for Using Art in Home Staging. Thanks to everyone who added their comments to my growing list of Stupid Staging Tricks and I hope the discussion will continue! For those of you who haven't added your two cents, please do so. All pet peeves and insights are welcome! Just go to this page and scroll down to add your comments! I hope you find the content of this issue of Staging Diva Dispatch helpful. I welcome your feedback, success stories and/or new story ideas! Happy Mother's Day! P.S. If you missed the Preview session I ran in April, you can listen to a recording here. Is Slumping Real Estate Market Bad for Stagers? 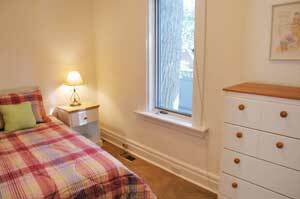 work better as a child's room in this three bedroom house. 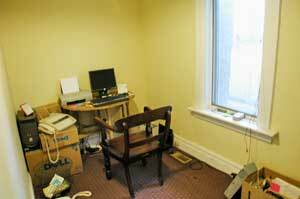 to help buyers imagine how they can use this small room. The goal of home staging is to help prospective buyers fall in love with the home. If you're working on a 3+ bedroom home in a family neighborhood, it's important to show a child's room (even if the current owners are childless). It doesn't take much to "set the stage." An attractive "bed in the bag" set for the twin bed, a nightstand and lamp, a small chest or dresser and some stuffed animals and kid's books. One or two pieces of appropriate art, and you're done! The idea here is that when families come through the home, a child will run in and say, "Oh Mommy, can this room be mine?" Don't forget the emotional power of this. Even if prospective buyers are touring the home without their children, you want to show them at least one room where they can imagine their own child being happy. If you're wondering what type of art to use in a child's room, I've built a collection for you for children of different ages in the Staging Diva Art Shop Kid's Bedroom Art Gallery. I've also done the math for you and with a small collection of art for home staging re-rented to your clients, you can make a tidy pr0fit! Learn how you can make almost $4,000 in your first year. I hear from so many aspiring stagers worrying that the slumping real estate market means it's a bad time to consider a career in home staging. Actually the opposite is true. Home sellers need us now more than ever! They are desperate for solutions that will give them a competitive edge in the slow real estate market. All most agents will recommend is dramatic cuts to their selling price. That's m0ney right out of the home seller's pocket. Staging is much cheaper for them! Here's an article I wrote for American Chronicle to spread the word to homeowners about why home staging is important, especially in a softening real estate market. 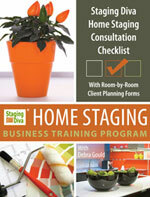 "Written by internationally recognized home staging expert Debra Gould, The Staging Diva, www.stagingdiva.com. ©2008, Six Elements Inc. Used with permission." If you use the story on a website or blog, "www.stagingdiva.com" must be a live link back to http://www.stagingdiva.com. The housing bubble has popped. Never before have home prices fallen so broadly on a national level. There are more homes for sale and fewer buyers which means less money in the average seller’s pocket. How can homeowners desperate to sell their home increase their chance of a quick and profitable sale in the current real estate market? People shop with logic and buy on emotion. If prospective buyers don't fall in love within minutes of walking into a house and have that same emotional connection all the way through, they'll be off to the next appointment. This is especially true in a buyer's market when they feel no pressure to make an immediate offer. There are several points you should keep in mind when hiring a Home Stager, including the home stager's knowledge of real estate and the local market in particular. Most importantly, however, you should be aware that the Home Staging industry is unregulated. There are no official home staging credentials, so you should not assume any Home Stager is an expert simply because he or she is "accredited" or "certified". It is always important to ask questions of anyone you are considering hiring. But in order to sell, a home must be marketed wisely. Statistics show that staging homes results in faster sales and higher prices than homes that are put on the market "as is". 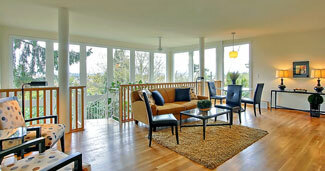 A small investment in staging can make a significant difference in the outcome of a sale. Congratulations to Staging Diva Graduate Amanda Freeman of Home Evolution (OR) who finished a project with a well known developer who has 100 properties a year that need staging. He wants her to work on more projects based on her success of having the home she staged under contract within 30 days of hitting the market (two months ahead of the average days on market in that area). And the buyer of the house contacted Amanda to inquire about buying some of the furnishings she used. She writes, "This could be the start of something big!" Isn't this room fantastic? Congratulations to Staging Diva Graduate Debra Rowley of Debra Rowley Interior Staging (WA) for turning a debris filled room into a welcoming oasis. It's no surprise this Seattle area house got a full price offer within a day. "I took your course 2 years ago, it's hard to believe! I am now teaching a "do-it-yourself" course at Conestoga College for those who want to ready their homes for re-sale, I have speaking engagements with the Chamber of Commerce, Public Libraries, Networking Groups and so much more. I have also been on the radio and been published in our local paper and a few magazines. This year I was a "feature speaker" at our Home and Garden Show! It is really exciting, not only my work, but the fact that I am raising a newborn business, and it is starting to crawl, even walk! Thanks for your advice!" Congratulations to Staging Diva Graduate Tara Hansen, Closing Stage LLC (WI) on her article in Appleton's Post-Crescent newspaper. The reporter also called me for background because Tara mentioned the Staging Diva Program. That was a smart move, because I could provide additional information for readers to turn it into a bigger story. Reporters always like to speak with multiple sources for a story, isn't it better that they call me rather than your local competitor? Within days of the story appearing, Tara booked 3 staging consultations, one redesign project and a presentation to local real estate agents. She also heard from local businesses who want to work with her. Such is the power of the media and why I teach you about how to reach them in course 4 of the Staging Diva Training Program. More about Tara's media coverage. Staging Diva Students and Graduates, send me your successes so we can celebrate your triumphs and inspire others! PLUS, being included in this newsletter gets you a F/ree home on my newest website. I also feature Graduates in my blog as you've seen from the stories above about Debra Rowley and Tara Hansen. Google indexes those stories the same day I post them, which is excellent F/ree publicity that I give you (but you have to do your part by sending me information I can use)! The more links I provide you with, the better for your business growth. Don't take home staging training just because you want "credentials" since there are none (not official ones at least). Notice I'm one of the only people offering a training program that tells you this. I could have made up fake credentials too, it's just not how I choose to do business. Anyone can call themselves a professional home stager, there are no requirements or licenses to do so. The only real reason to take a course is if you feel the content will improve your chance of success. Look for a trainer who has a proven track record of success as a home stager. Otherwise, what proof is there that their methods work in the real world? Look for evidence that there's a genuine interest in sharing real information and providing ongoing support for your growth. Check out comments from real people who have taken the program. Are you promised unlimited one on one access to the head of the company, forever? Ask yourself whether this is realistic and whether you are being promised other things that are impossible too. Are you being promised a guaranteed home staging "job" upon completion of a training program? There's no such thing because home stagers are independent businesses. If they were to hire a home stager to help them, it wouldn't be a full time "job," it would be project by project. So claims about guaranteed employment should raise a red flag for you. Are you being told you'll be left out in the cold if you don't take a specific program because suppliers won't deal with you? That's nonsense. It's a competitive world out there and furniture rental companies, storage companies, junk removal services, etc., want your business no matter what training you've taken (or not). Of course you can still negotiate discounts with them if you have your own staging company. And I teach you how to do that in course 5. You don't need someone else to do it for you and you'll always get a better deal if you build the relationship and negotiate for yourself. Home Staging is a completely unregulated industry so be careful and consider whether the claims you read are too good to be true. Making choices based on information rather than irrational fear is always a safer route.